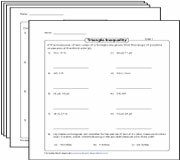 Gain an in-depth knowledge with this batch of worksheets on inequalities in a triangle, meticulously drafted for high-school students; featuring skills to comprehend the relationship between angles and sides of a triangle. 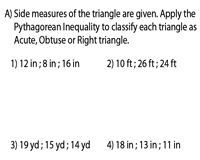 Get a clear understanding of the triangle inequality theorem, classify the triangles as acute, obtuse or right triangle based on Pythagorean inequalities and much more. The largest angle is opposite to the longest side and the smallest is opposite to the shortest side. 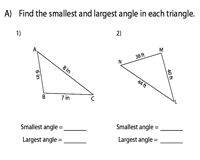 Direct students to find the smallest and the largest angles and arrange them in ascending and descending order. 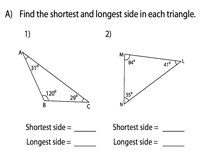 Recall the relationship between angles and sides of a triangle and figure out the shortest and longest sides based on the angles in Part A, order the sides from shortest to longest in Part B and vice versa in Part C.
Comprehend the triangle inequality theorem with PDFs to determine if the side measures form a triangle, find the range of possible measures, the lowest and greatest possible measures of the third side and more. 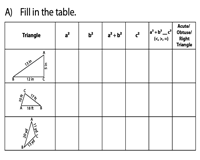 Add up the squares of two sides and compare it with the square of the third side and classify the triangles as acute, obtuse or right triangle using Pythagorean inequality theorem and tabulate the answers. Apply the Pythagorean inequality theorem to classify the triangle as a right triangle if the value of a2 + b2 is equal to c2, as an acute triangle if it is greater than c2 and obtuse if lesser than c2.